We prepare plans and schedules for all types of building projects and supervise construction work for many of our clients. Whilst we specialise in the tender process and supervise construction of new build housing, extensions, and small or large retail developments we are also experts in the adaptation of properties for disabled facilities grant customers. All building work has to comply with the building regulations, which are part of the Building Act 1984 (Amended by the building regulations act 1991). These regulations stipulate the precise method of constructing a building in, at the moment, 13 different areas of construction. 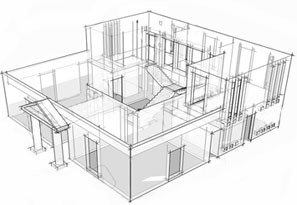 We can help and advise on all aspects of building regulations and planning permission issues. With our team of experts we can handle all aspects of the required management solution including Preparing bills of quantities, Pre & post contract services, Schedule of materials, Competitive tender preparation, Budget estimates, Cost plans, Interim valuations, Final accounts and Sub contract account management. We work with you and your team to understand your needs and budget to design a solution that works for you. If you don't have a project plan that details the type of development you would like to build, we will work with you to develop one. Your day to day schedules and activities, your budget and how you would like to the program grow, all of this is brought together to develop an amazing concept design.